Back home I did some research. They didn’t seem too difficult; I’d certainly tackled more complicated dim sum recipes. It starts with a pretty basic bread dough, a milk based dough filled with a coconut-sugar concoction. The polar vortex had me cooped up and I didn’t have anything better to do so I made some coconut buns. But just not any old bun. Oh no. 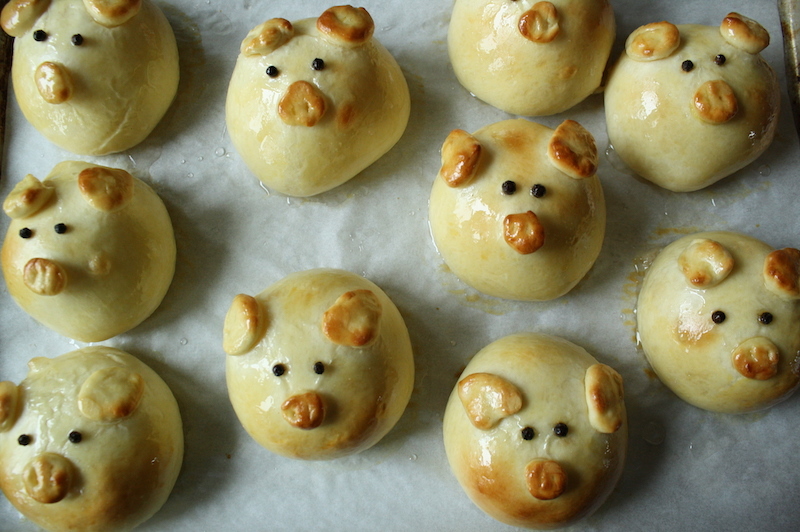 Today is the Lunar New Year and it is the Year of the Pig so I made piggy buns and they are the damn cutest things I’ve ever made. Nothing about this is difficult; the dough comes together easily and is a dream to work with. It’s rolled into circles, a ball of the filling is placed in the center and the edges are gathered up and pinched to form a ball. A little rolling with a cupped hand helps smooth out the seal and form a nice, tight bun. Of course there’s a trick: roll the edges of the circle thinner, leaving a little hump in the center. This will make a nicely formed bun that’s not too bready on the top or bottom with the filling nicely distributed throughout. Making the faces is a bit futzy but not difficult. Some of the dough is saved for decorating and while the filled buns are rising, little bits are pinched off for the ears and snouts to move things along quickly when the time comes. Pea sized bits turn into flat ovals for the snouts, slightly larger pieces are stretched into triangles for the ears and everything is glued onto the buns with some egg wash with two peppercorns for the eyes. Adorable. Halfway through baking, the little bits were browning too quickly so I covered the pan with foil and performed some emergency surgery to reattach an ear or two that had slid off with a bit of egg wash. Hey, it happens. The sugar syrup brushed at the end of baking is traditional; it adds flavor and a lovely sheen but it’s a bit sticky and I suppose you could skip it if you like. I wouldn’t. Gong hei fat choy my friends! STRESS BAKING THERAPY FACTOR: C’MON! How can you not look at these and smile? Working some zoomorphism into your food is always a good time, though cute food isn’t often good food as some tend to favor cutesy, instagram worthy pictures over flavor. This is not one of those. These are delicious! I suppose I should have filled them with something porky to continue the theme but turns out, I really like coconut buns. Don’t tell that lady. To move things along a little more quickly, form all the little dough balls for the snouts and ears while the buns are rising. Add thecream,egg, sugar, flour and salt to the bowl and mix on low with dough hook attachment until it begins to come together then increase the speed to medium and mix for 10 minutes until the dough is smooth and silky. Turn the dough out onto a work surface, scraping the bowl if needed, and knead a few times by hand. It will be moist and a bit sticky – that’s ok.
Spray the bowl with cooking spray, place the dough in the bowl and spray the top of the dough. Cover the bowl with plastic wrap or a damp towel and let rise in a warm spot for 1 hour until doubled in bulk. for the filling: In a medium bowl, blend the butter and vanilla with a rubber spatula until combined. Divide into 10 equal pieces, roll into balls and set aside until needed. to shape: line a sheet pan with parchment paper or a silicone baking mat and set aside until needed. Cut the remaining dough into 10 equal pieces. Roll into balls, cover with plastic wrap and let rest 5 minutes. Working with one ball of dough at a time, flatten and roll into a 4” circle. Roll the edges thinner than the center; there should be a small mound of dough in the center. Place a piece of filling in the middle of each circle on top of the hump. Lightly moisten the edges of the dough with water, bring the edges up to the center and pinch tightly to seal. Turn the ball seam side down on the work surface and cupping the bun with the palm of your hand and your fingers surrounding the ball, roll it vigorously against the work surface to seal and smooth the seams. It might help to have a slightly damp work surface for a little traction. Transfer the buns, seam sides down, to the prepared sheet pan with at least 1 ½” between. Cover with plastic wrap or a clean kitchen towel and allow to rise in a warm spot for 30 minutes until puffy and not quite doubled in size. While the buns are rising, get the dough for the snouts and ears ready. Unwrap the ball of reserved dough. 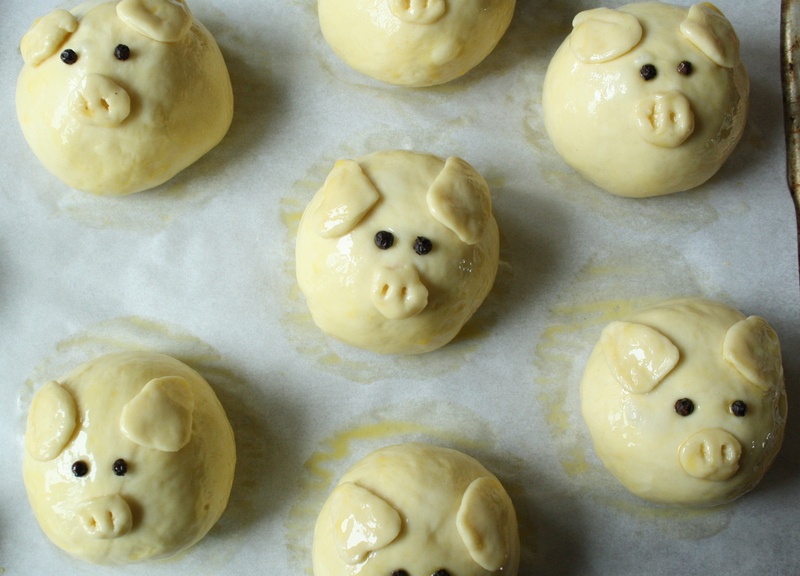 For the snouts, pinch off 10 pieces of dough about the size of a pea. For the ears, pinch off 20 pieces of dough slightly larger, about the size of a garbanzo bean. Cover with plastic wrap until needed. for the egg wash: beat the egg and water together in a small bowl until well blended. Preheat the oven to 350°F and place a rack in the lower third of the oven. Working with one bun at a time, brush generously with the egg wash. Run your fingers around the bottom and sides to make sure it is fully coated. eyes: place two peppercorns above the snout for eyes. Push in gently to adhere. ears: form two of the larger pieces of dough into triangles; the size depends on the size of the buns. Eyeball it. Egg wash the bottom of each piece and place above the eyes for the pig’s ears. Repeat this process for the remaining buns. Once all the buns have faces, gently egg wash the snouts and ears. to bake: Bake for 10 minutes. Cover with a piece of foil (the ears and snouts have a tendency to brown much more quickly than the rest of the bun.) If any ears or snouts have slid off, carefully reattach with a bit of egg wash.
Rotate the pan and bake for an additional 5-8 minutes until lightly golden brown. If not quite brown enough, remove the foil and bake for a few additional minutes. for the glaze: While the buns are baking, stir the sugar and hot water until dissolved. Remove the buns from the oven when golden brown, and brush all over with the sugar syrup while hot. Best served the day of baking (while warm!) but these will hold, tightly wrapped, for a day or two. oh that’s cute! I’d suggest bunnies also for easter but I’ve seen some hilarious fails on bunny buns. on February 5, 2019 at 3:09 pm | Reply Monsieur R.
I’ll take my coconut in a pina colada, thank you. Now, an adorable piggy pork bun? Just take my money now.